Iran’s Islamic Revolutionary Guards Corps (IRGC) naval commander claimed Monday that his men harvested extensive information from cell phones and laptops confiscated from the 10 American sailors held in custody last month, according to Iranian media. The Tasnim News Agency, which is affiliated with the IRGC, reported that Admiral Ali Fadavi made the admission during a session of Iranian parliament. "We have extracted extensive information from their [American sailors’] laptops and cell phones," Fadavi reportedly said. He added that the information could be made public if a decision were made to release it. The U.S. sailors and their two small Navy boats were arrested by Iran on January 12 for allegedly drifting into Iranian territorial waters. While Iran initially promised to release them promptly, the American personnel were held overnight and released the following morning. A preliminary report from the Pentagon on the events found that Iran returned two of the sailors’ cell phones without their SIM cards. The U.S. Central Command report also confirmed that the sailors were arrested at gunpoint. Following the sailors’ release, Iran state media released images and video of the sailors in captivity, their weapons and equipment seized by the IRGC. Some photos also showed Iranian personnel sifting through their weapons and viewing their documents. Fadavi claimed Monday that the IRGC has more footage–spanning several hours–of the U.S. sailors in detention. He said that the video would humiliate the United States 100 times more than the footage previously released. 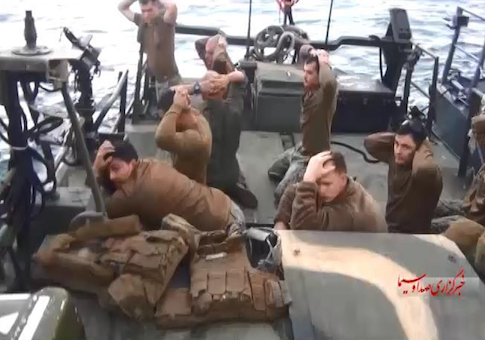 However, White House press secretary Josh Earnest said last month that President Obama was not embarrassed by the footage of the sailors released by Iran. Before his remarks Monday, Fadavi was honored by Iran’s supreme leader for arresting the American sailors. He and four other Iranian navy commanders were awarded the Order of Fat’h (Victory) medal for their actions. This entry was posted in National Security and tagged Iran, Military, Navy. Bookmark the permalink.